The original house from 1890 evoked an era of times gone past with its grand Victorian architecture. Pieces of its history were left behind for the client to find, like the original blueprints tucked away in the attic and the original service bell. 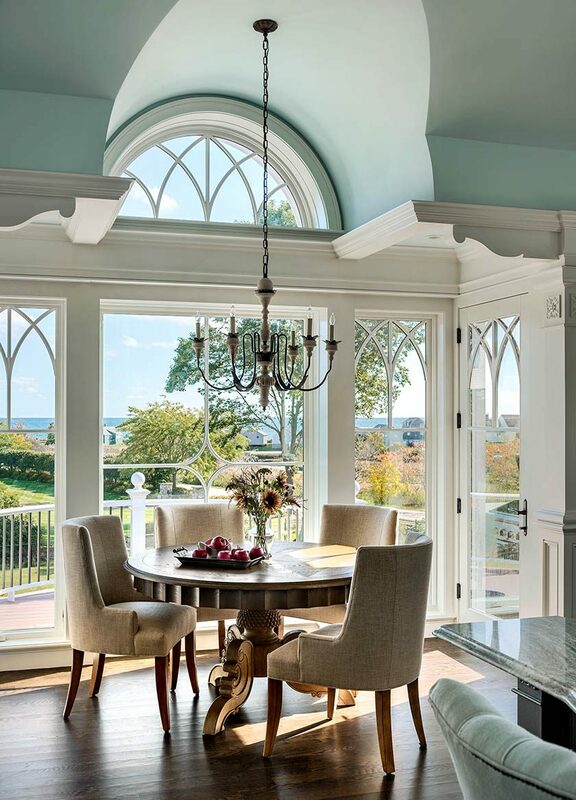 Ideally situated with unobstructed views of the ocean, the house provided a wonderful canvas to mix old and new style elements to give it a much-needed makeover. 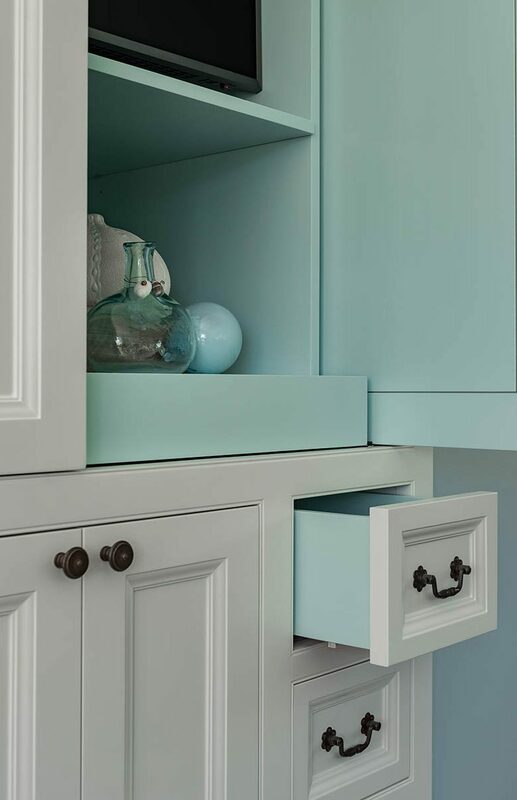 Taking cues from the surrounding coastal landscape, soft tones of blue are generously used throughout the home with dark stained white oak flooring to ground the space. 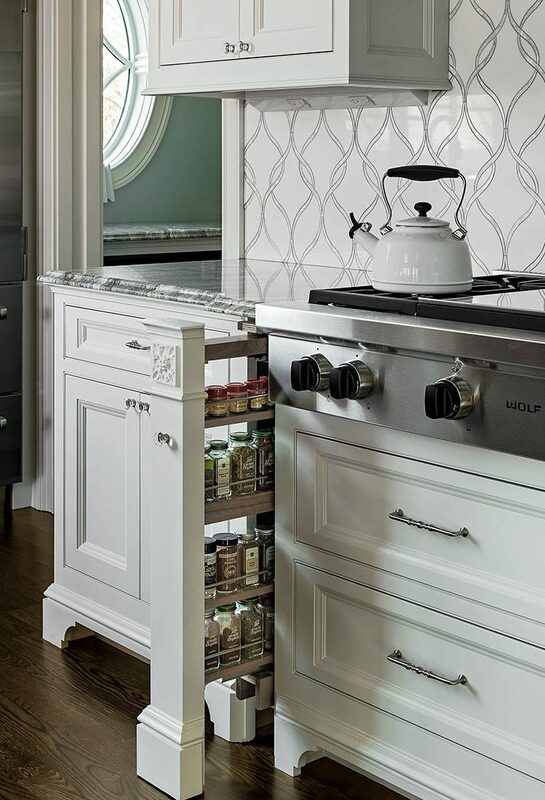 The direction from the client was to create a classic, both refined and casual interior. 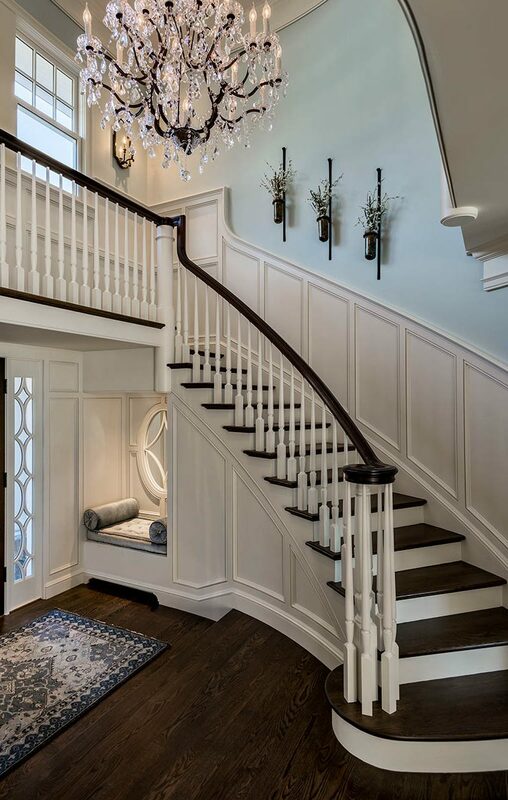 At the main entry you are met with a grand curved stair, modeled after the original design, adorned with a show stopping crystal chandelier above. 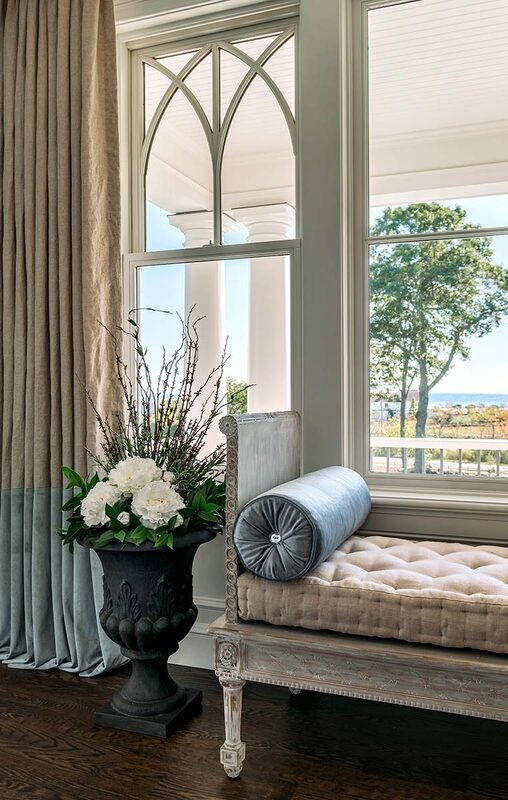 As you look beyond, you are immediately captivated by the view of the ocean framed by custom drapery of linen and velvet, with a French country style bench providing a place to perch. 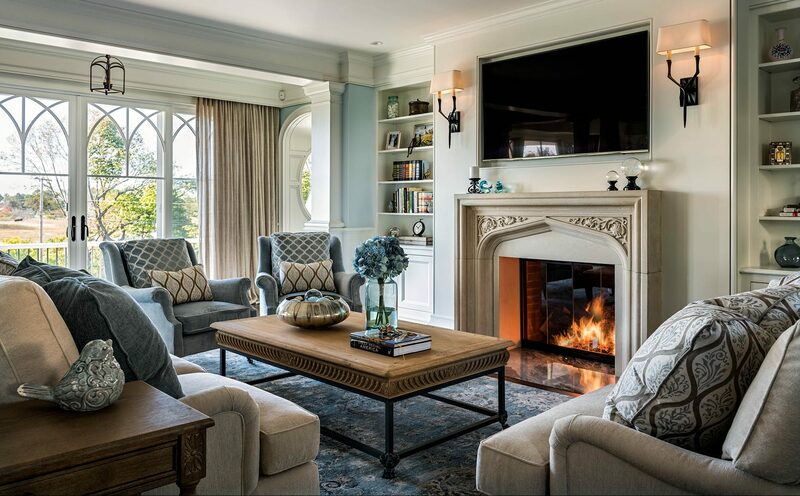 The formal living room has built-in bookshelves flanking one of the original fireplaces updated with a gas log set, marble hearth and limestone mantle. 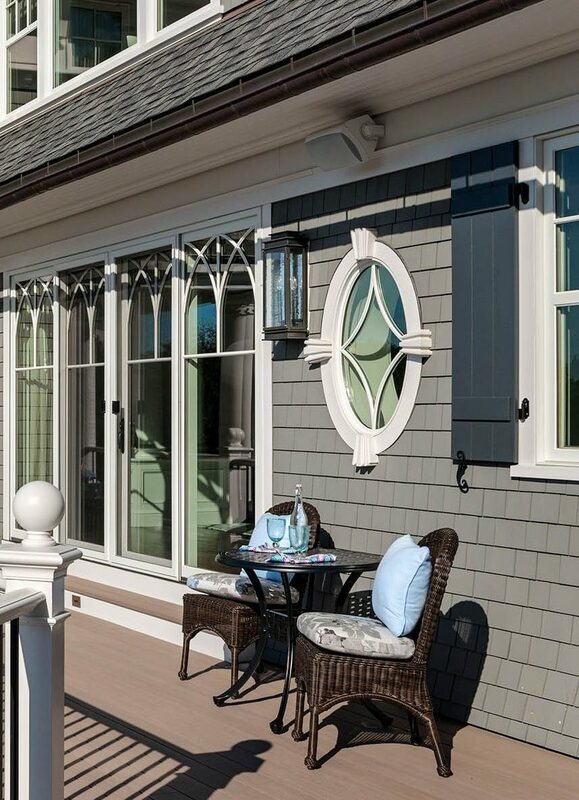 From there, custom bronze lanterns guide your way down the main hallway to the guest suite and sunroom. 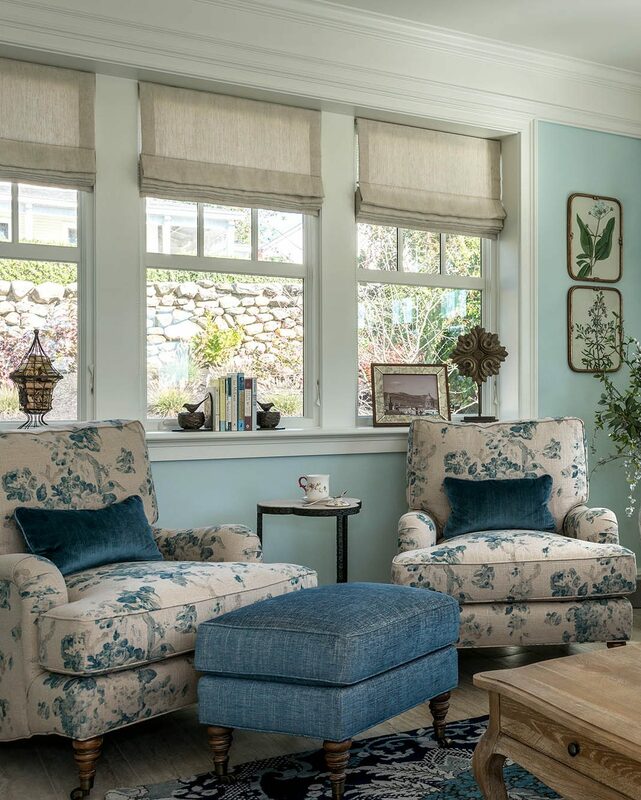 The sunroom is drenched in sunlight throughout the day, offering stunning views of the ocean and a cozy space to rest. 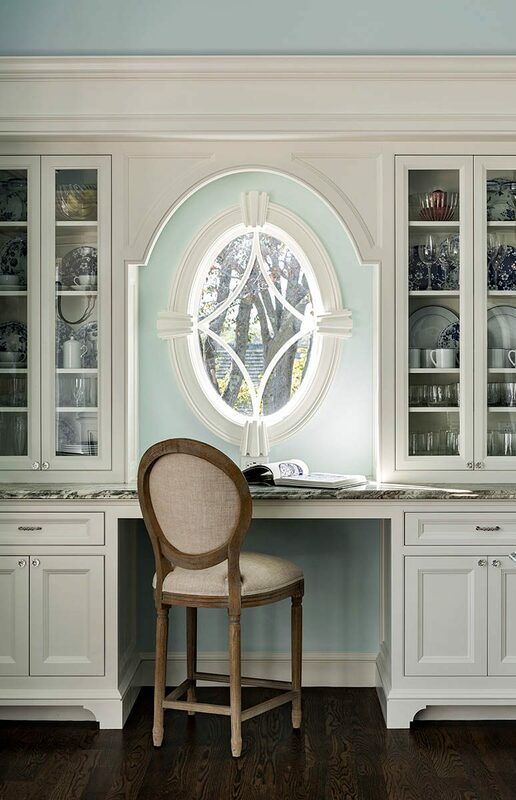 Some of the furnishings include custom oversized lounge chairs upholstered in a Ralph Lauren floral print, and a Louis XIV style desk chair, and desk adding a sense of romance and charm. At the far south end of the house a generously sized eat-in kitchen is ideal for both finding your inner chef and entertaining a large group. It features an expansive stained white oak island complete with fantasy brown granite countertop. 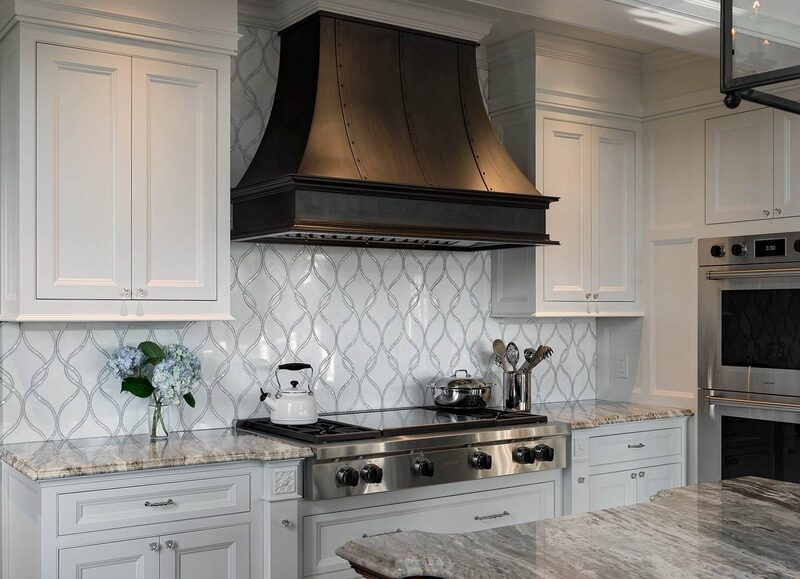 The custom bronze hood is framed with a stunning waterjet cut marble, and shell tile with dramatic bronze lanterns above. 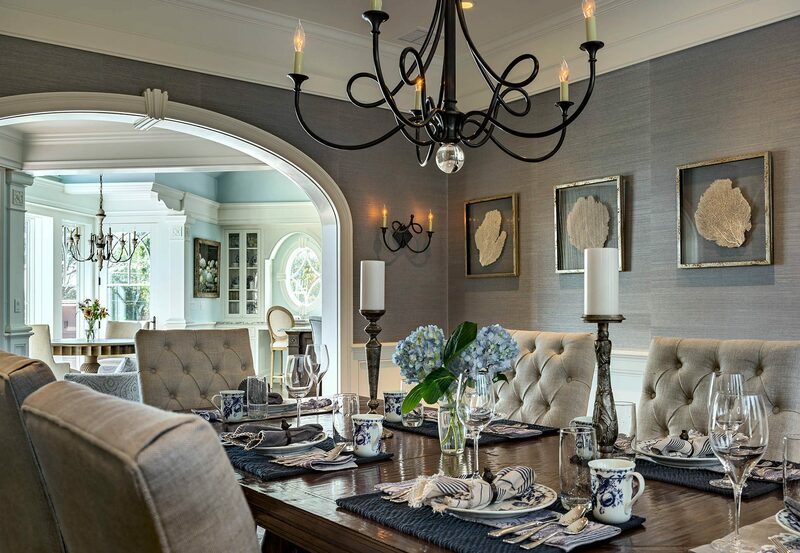 The formal dining room brings an air of casual sophistication with an heirloom mahogany dining table, airy blue grass cloth wallpaper and a lustrous silk area rug customized to fit the space perfectly. 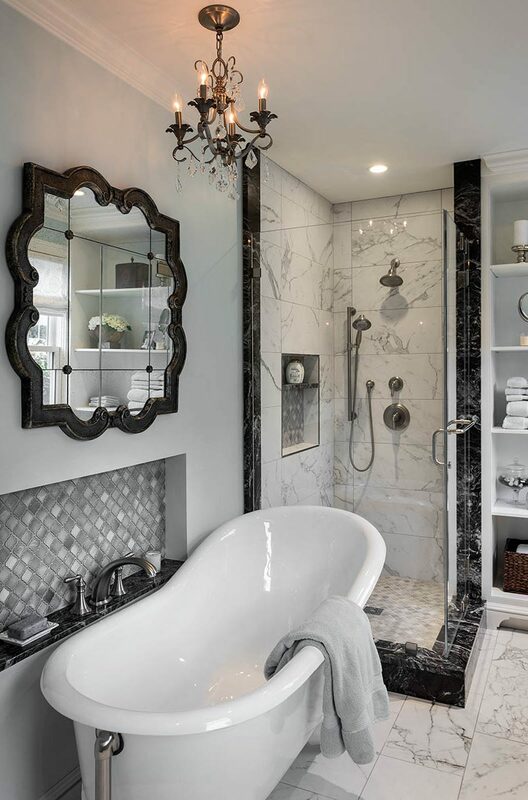 The master suite on the second floor exudes comfort and luxury. 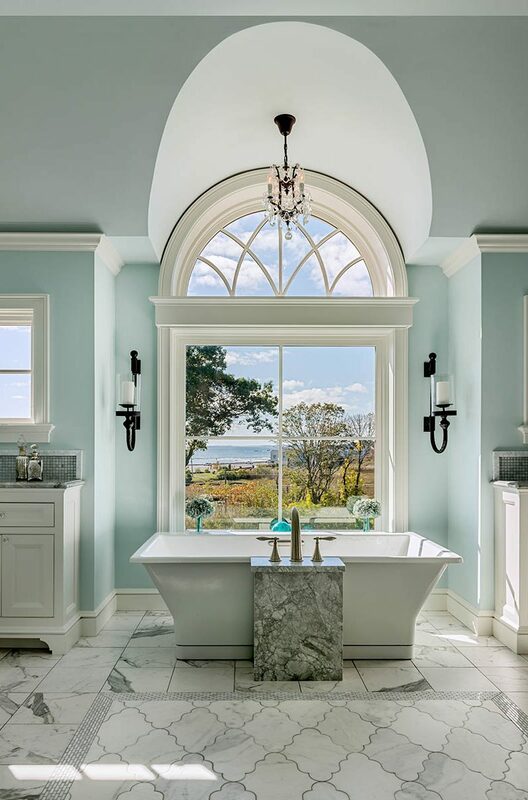 Taking advantage of some of the best views the home has to offer, the master bath, with its marble tile accents and fully tiled shower, includes an oversized soaking tub beneath a crystal chandelier with a direct view of the ocean for the ultimate experience in relaxation. 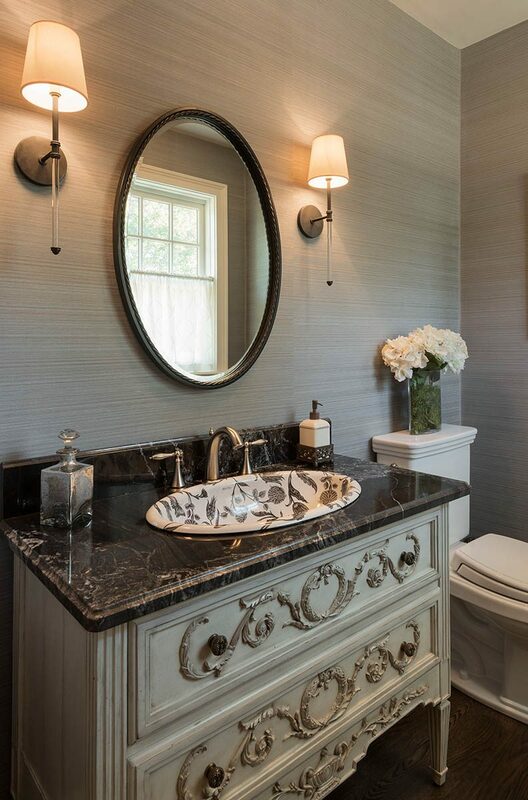 His and her built-in vanities line the perimeter. 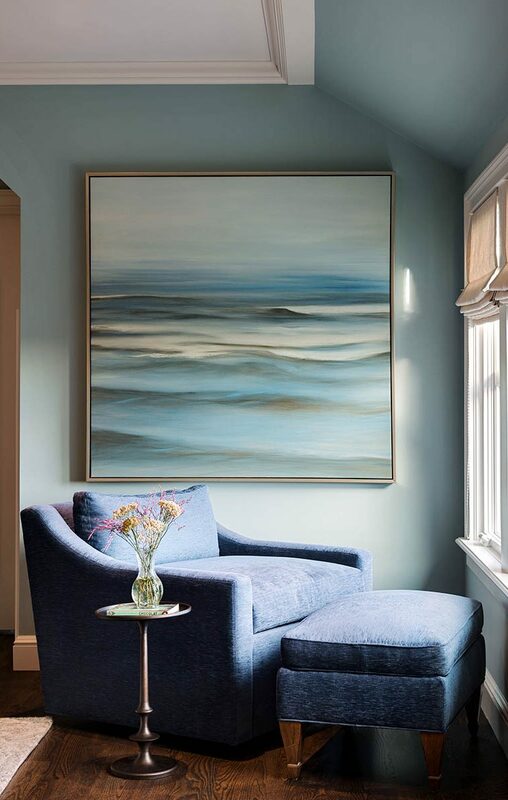 Custom made furniture, lighting, drapery, curated accessories, bed linens and hand-picked artwork bring in character and texture to complete this beautiful coastal home. • Custom upholstery furniture throughout the home. 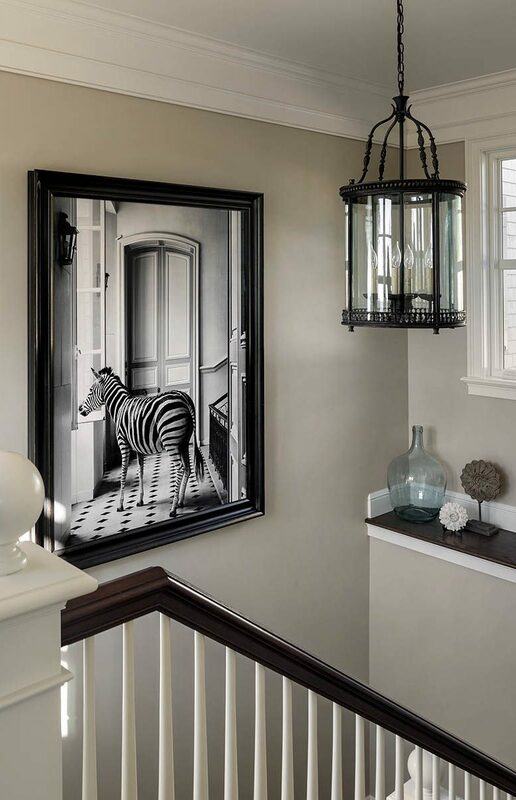 • Artwork package including a large scale giclée print by William Curtis Rolf, and a limited edition giclée print of a drawing done by Alan McGee from Maine. • Custom ornamental bronze exhaust hood shroud made in Colorado. 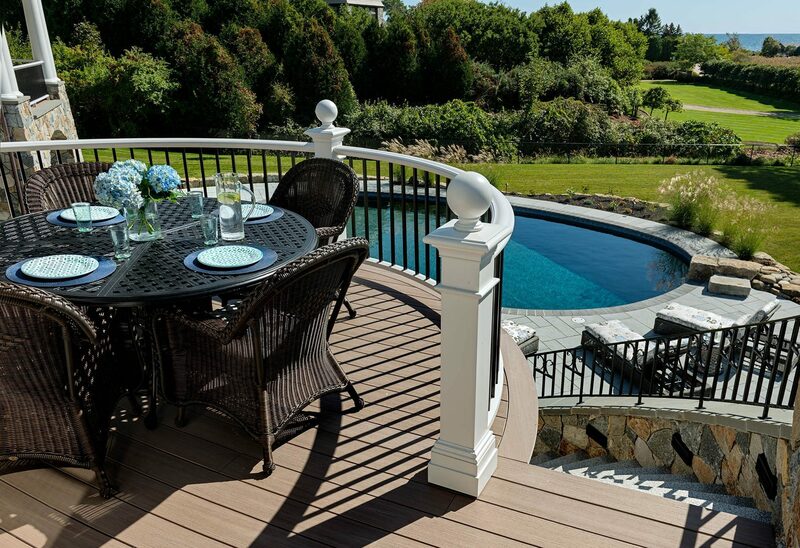 • TMS Interiors selected all the porch and patio furniture along with the client to create a backyard getaway complete with two dining spaces, a lounge seating area, and pool side lounging area.